Strawberry season has ended here in Florida, but we’re still enjoying strawberries that have been shipped in from the West Coast. They’re not quite as sweet and delicious, so I like to help them out a bit by adding a little sweetness to them. Usually we’ll just dip our berries on some sugar or maybe lightly sweetened cream. For these berries though, I wanted to make them a bit more special because we were having a few friends over. I cut the tops and bottom (so that they would stand up) on about a dozen strawberries. Then I hollowed each berry out for the filling, and filling my pipping bag with PHILADELPHIA Snack Delights milk chocolate cream cheese spread. Then I just piped in the filling and crumbled some graham crackers on top. 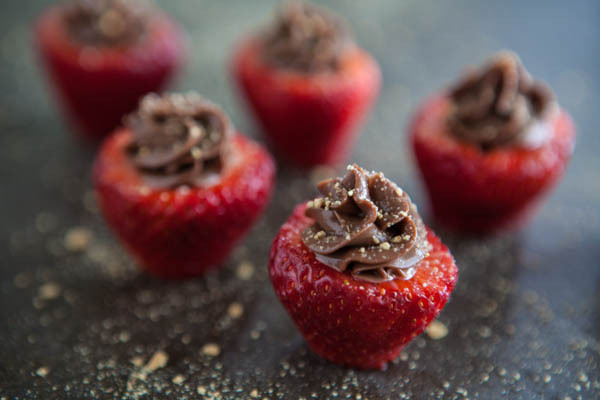 I made these little bites with milk chocolate. Snack Delights also comes in Milk Chocolate, Dark Chocolate (my fav! ), Cinnamon and Caramel flavors. 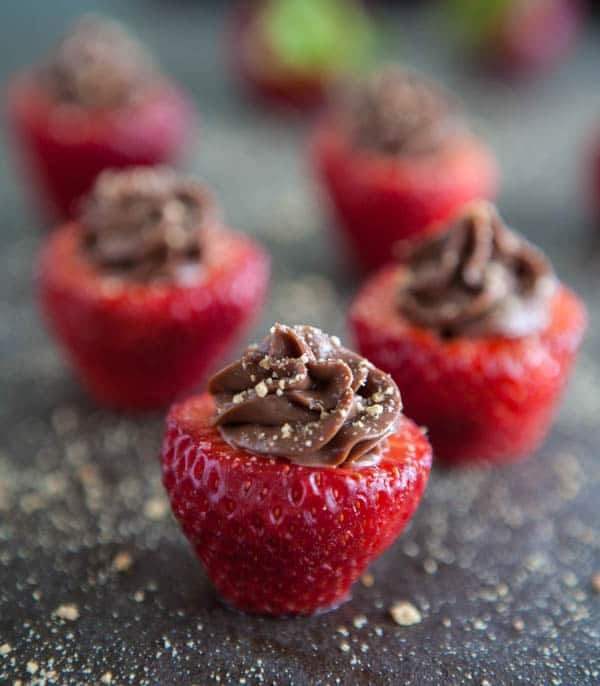 These chocolate strawberry bites are so quick and easy to make and perfect for parties and get-togethers, or just because! Cut tops and bottoms off berries. Using a paring knife, cut out the inside of the berry for the filling. Fill pastry bag with decorative tip with PHILADELPHIA Snack Delights milk chocolate cream cheese spread. Pipe into strawberries. 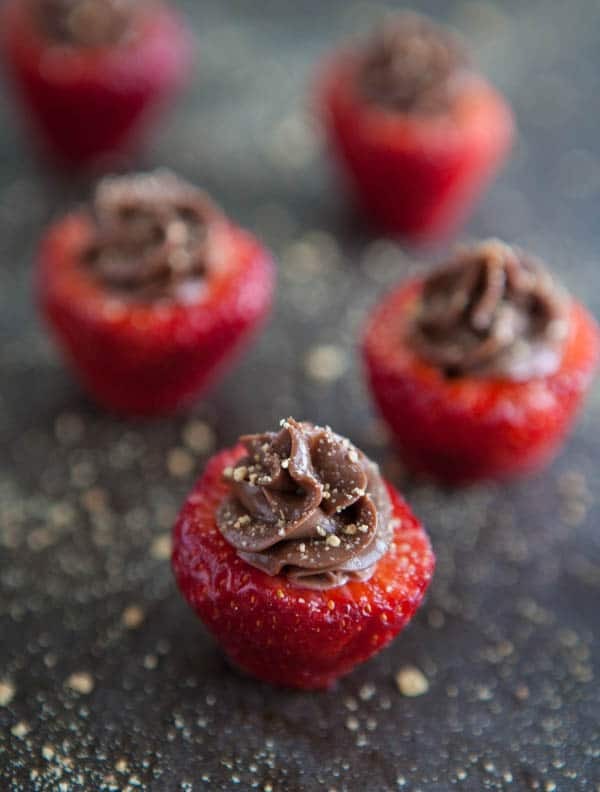 Sprinkle strawberries with crumbled graham crackers. This post sponsored by PHILADELPHIA Snack Delights. All opinions 100% mine. I would take down 12 of those right about NOW. MMmm.. these are delicious gems! Chocolate and strawberries, my favorite! So pretty too! I love, love, love these! I can’t wait to try them…immediately!!! Perfect little bites to pop in my mouth!! These look great, Angie! Perfect little bite-sized desserts! I make a similar recipe using plain cream cheese mixed with stevia. You can top with nuts, chocolate shavings or graham cracker crumbs. I never thought of using a chocolate version. I’ll have to check to see if it’s gluten free. That would be awesome, too! It sounds great! What a cute presentation and a great idea for a party! I think I need these now! Beautiful photos! My wife loves strawberries and chocolate. It’s been a traditional gift I give her every valentines day. Well, tonight I’ll surprise her. Valentines day will be twice this year.